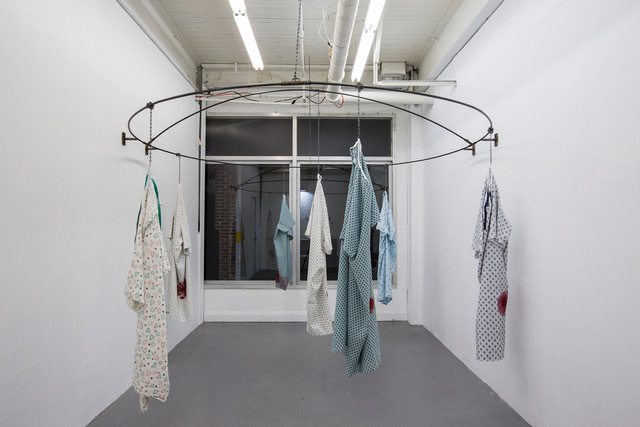 Blood, organs, and surgical paraphernalia are not objects you’d traditionally expect to see exhibited in a gallery. However, visual artist Ellie Dent demonstrates boldness that throws caution to the wind in her exploration of human trauma. Her work began as visualizing disease as self-portraiture through painting depictions of chaotic microorganisms wreaking havoc deep within the human body. 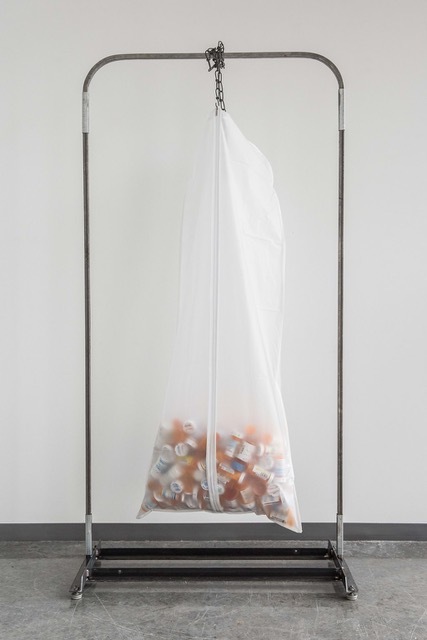 The artist's conceptual work has evolved into pondering the role of the medical industry in our lives, the emotional turmoil disease spawns within us, and the arduous task of accessing healthcare. Ellie Dent born outside of Baltimore, MD received a BFA from Towson University and an MFA from the University of Georgia, Lamar Dodd School of Arts. A 2019 MINT Leap Year Artist and recently awarded the “Work Study Scholarship” from Penland School of Crafts, Dent is unarguably one of today’s most refreshing working artists. Early this year Rigby Ink visited Ellie Dent inside of her studio in Atlanta’s Goat Farm Art Center. As we entered the studio the impeccably organized white desk with a bright colored rug give no indication of blood or gut creations. Only when our eyes catch the titles of medical textbooks neatly shelved inside of a bookcase do we have our first clue of what Dent has been up to. In our conversation, Ellie shares with us her curiosity for science and path of conceptual artwork. RIGBY INK: Tell me about your creative journey. ELLIE DENT: I grew up in a big family with three brothers on 20 acres of land. On Saturday mornings my parents would open the door and tell us to go outside and play. So rather than watching cartoons, my siblings and I spent our free time roaming in nature. As a child I always academic, but I was also a tactile learner. I would use my hands to do everything. My mom was a ceramicist and had a studio in our home. After dinner on Friday nights, my mom would indulge me by allowing me into her studio to play around making ceramics with her. Although my mom was the artist in the family I find that I was most creatively influenced by my oldest brother who attended the Maryland Institute College of Art where he studied Sculpture. After a year and a half in school, my brother at 19 years old dropped out of college to start his own business. His desire for making functional design led him to create a machine and fabrication shop building things like race cars. As his kid sister, I would work in his shop mopping the floors and even running machines that cut raw metal into shapes. Witnessing my brother’s ambition and creative drive coupled with my deposition for working with my hands is what really pushed me into an artistic path. RIGBY INK: You make paintings and objects that visualize disease and you describe your work as self-portraiture. Can you share more about that? ED: As a child, I learned how to draw from a series of encyclopedias. My mom bought me tracing paper and I would trace all of the animals, plants, bugs, and fungi from those encyclopedias. From a young age, I have always been drawn to scientific illustration. While in my undergraduate program at the University of Georgia students were tasked by professors to create a series of work. At that time I was strictly focused on work related to science however, I didn't want to go into scientific illustration because I interested in making conceptual artwork. During my junior year, I had a really challenging semester regarding my mental health. It was kind of a jarring thing for me because it seemed to come out of nowhere. I shared with one of my professors that I was feeling distracted and I couldn't get anything done. My professor Paul Jeans, who is now one of my mentors said, the best thing that I could do was to make work about the way I was feeling and to deal with it on paper. I don't know what that meant, but I tried it. I started making work about what I imagined my brain looked like during this time of poor mental health. I started with cellular imagery to imagine what my body looked like on a microscopic level as a way to understand myself. Then as I kept making these paintings, I realized that those were a kind of self-portraiture. That work has evolved to what's going on right now in my practice. I began thinking about other traumatic events that have happened to my body. When I was 12 years old I had appendicitis. However, at the time, my dad was out of a job so we didn't have health insurance. My parents thought I had a stomach bug and ended up waiting too long to take me into the emergency room. By the time I arrived at the hospital, my appendix ruptured. After waking up from an emergency appendectomy the physician told me I was nearly septic. As a 12-year-old, I was like, what's sepsis? At that age understanding the severity of my condition and grasping the closeness of death was devastating. Those were the childhood memories that I drew from when I began recalling my experiences in the medical industry. It was what fueled my interest in diving into this subject matter while using my work to better deal with my mental health in school. RIGBY INK: In Souvenirs of Humiliation you’ve paired objects that are somewhat unsightly or even embarrassing such as illustrations of varicose veins drawn onto hospital sanitary paper. How does the conceptual process take shape for you? ED: For Souvenirs of Humiliation I was working with medical sanitation paper. It is a material that is universally known to anyone who has stepped into a medical examination room. Everyone has sat on that stupid paper before and it doesn't do anything. It's there to make you feel like it's sanitary and shield you from whatever germs were carried by the person before you. It heightens the anxiety of going to the doctor tremendously. As you wait 30 minutes for the doctor to show up, every move you make crinkles and rips the paper. I worked on that paper because I was trying to simulate that feeling of waiting for a doctor. Going to the doctor and having your body examined is incredibly vulnerable no matter your gender or your illness. It's an invasive experience and oftentimes going to the doctor means having to deal with health insurance. Which for me is personally an anxiety-riddled task. So I drive that sensation and I focus on how can I amplify that feeling of vulnerability further. I ask myself what else about going to the doctor makes me feel vulnerable or humiliated. Then I consider the materials and actions involved in creating that emotion. My process is very much about conceptualizing the emotions of experience and building from that through my chosen materials. RIGBY INK: Considering the scientific subject of your work, how much research is involved in your projects? ED: The research is nonstop for me and it’s something I love. The average person may lay in bed at night reading a fictional novel, however I’m up late researching colonoscopies. Researching is how I spend much of my free time. I’m constantly listening to medical podcasts and true crime stories. While in college I had access to the University’s science library which was a tremendous resource. Also, I am a lover of medical museums. To look at wet specimens and anything in a jar is like being a kid in a candy shop. I’ve visited The Mütter Museum in Philadelphia, through The College of Physicians. The founder Dr. Thomas Dent Mütter was was an avid collector of organs, specimens, and surgical instruments, at a time in science where consent wasn't necessary. Inside of the museum, all of his collections are on display and included are hand illustrated textbooks. That museum is probably my favorite place in the world. RIGBY INK: For your work in Subject & Shifted you’ve used women’s contraception and prescription bottles among other items as a reflection of the power of the healthcare industry. Highlighting the political debate over women’s healthcare. Why was that important for you to share? ED: My work has always been read as feminine and I think at some point I was really put off by that because I didn’t want people to gender my work. I think that can limit the read of it. Then 2016 happened and I got mad. I got mad in a lot of different ways. One because in 2016 I turned 26 and I had to buy my own health insurance. So I was pissed because that process is irritating and really disheartening. Also politically, I felt that women were in a spotlight. I was really sick of turning on the TV and hearing male reporters talk about the Women's March and talk about Planned Parenthood defunding. At some point I was like, can you [reporter] just shut up? This is not your place to tell me what I should or shouldn't do with my body. It took me a long time to say that my work is political, but it absolutely is. Also I have the experience of being a woman dealing with the medical industry. Female bodies just physically require more maintenance. We’ve got different organs than a man and we’ve got different doctors. Women have to do a lot more to make sure that we’re healthy and those experiences are incredibly vulnerable. To me gaining control and autonomy is nearly impossible because our health industry is so regulated by corporations that we can’t make our own decisions about our bodies. I don't think that my work is directly advocating for medical reform, but I think it's easy to get there if you spend some time with the work. You'll realize that I'm mad. RIGBY INK: You have a new studio located in he Goat Farm Art Center. Looking into 2019, what do you hope to achieve in this space? ED: I’m currently focused on interaction between steel and medical materials. I want to continue experimenting on surfaces and the substrates that are foreign to me. Conceptually I like relating our current medical system to the meat and food industry. I compare the unsterile and unregulated food industry to our relationship with food in our everyday lives. Although the medical industry is sterile there are similarities between the two. Oftentimes it is very unregulated or its regulated so much that it's inaccessible. That also makes it is scary because it's a secret. I put those two ideas together and think about the human body being treated as that of a carcass. That's why a lot of objects in my work are hanging from meat hooks and chains. I’m striving to bring awareness of our autonomy and how we're able to gain control of our bodies in a medical industry that makes us feel like we can't.